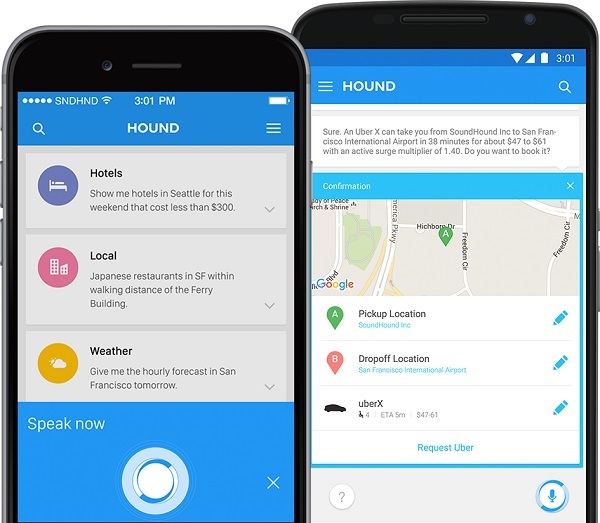 SoundHound launches virtual assistant app Hound for Android and iOS. SoundHound today launches a new app called Hound for Android and iOS devices. Hound is a hands free way to quickly and intuitively get what you want. Hound is the best way to search using your voice. The fastest and easiest way to get the information, entertainment, and communication services you want, Hound is built for your busy life, allowing you to get what you need and move on. You can use it hands-free by saying, "Ok Hound…". + "What's the weather going to be like tomorrow at 6pm? + "How about in Hawaii during August?" + Ask for restaurants, coffee shops, stores, and be as specific as you'd like. + You can even exclude places that you don't want. + "Show Restaurants within 10 miles except for Chinese"
+ "Show me directions to the nearest Starbucks"
+ "Show hotels in Seattle that are pet-friendly, have a gym, and cost less than $275"
+ "What is the square root of 16 minus the square root of 9?" And more: Video search, News search, Photo & Image search, Stock Prices, Flight status, Date and Time, Alarm and Timer, Music search including "SoundHound Now" feature - activate a music recognition search or a Sing/Hum search, Mortgage Calculator, Unit conversion, Word and phrase translation, Wikipedia, Play interactive games… and more coming soon!